It’s clear to me that in my time visiting Nottingham city centre pubs, for some thirty years now since my first student layabout phase, things have changed irrevocably. It’s easy to take the familiar stance that ‘things aren’t what they used to be’ and that would indeed be accurate, but let’s not forget how some things have changed for the better. Perhaps the most successful pubs for me are the ones that have embraced both change and tradition. A scarcity of those places leads me through the doors of a much shortened list of Nottingham pubs these days. One or two real nuggets will hopefully always remain though. A classic example of this is the splendid Lincolnshire Poacher, perched half way up the main arterial Mansfield road, amidst what has been a classic Nottingham pub crawl for many years. It’s difficult to remember sometimes that ‘The Poacher’ has only been around in its present form since the late 1980s. The pub rising like a phoenix from what remained of The Old Grey Nags Head – a past still reflected by an odd engraved window or two. The pub is owned by the Castle Rock Brewery group which as many would agree is normally a recipe for good and varied beer choices and inexpensive yet imaginative meals. For me, Castle Rock appear to have things about right, the drink and food is always interesting and of good quality whilst the pubs have a genuine ‘pub’ feel about them rather than the ‘eating house with room for drinkers’ that is sometimes the case these days. 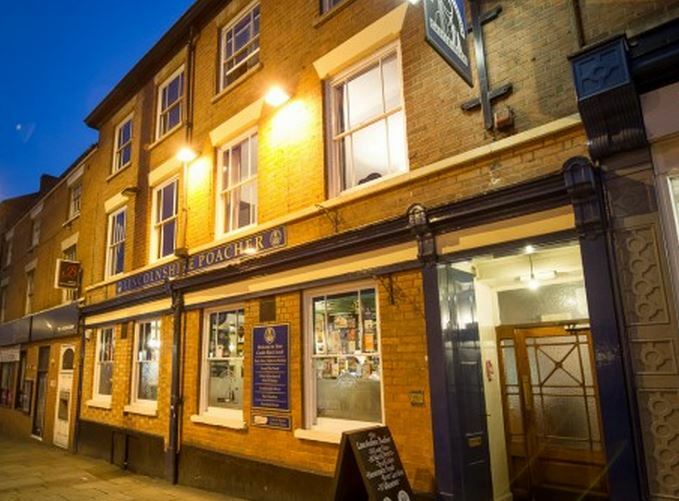 The Lincolnshire Poacher always offers a healthy suite of excellent beers, continental lagers and ciders, whilst the top shelf has a truly formidable array of single malts for those with the inclination for a dram or three. Certainly, I love the atmosphere of the Poacher, it reminds me of a genuine ‘alehouse’ as such but one in which you can find any walk of life within its walls. The pub has an extremely wide customer base but retains its cosy ‘ordinary’ feel. Anecdote has it that a previous landlord, when asked at the bar by a group of bright young things on their way to town for an alcopop-type frenzy, directed them towards the city centre with the words ‘sorry, we don’t serve disco drinks in here’ That’s such a great part of the pub’s appeal, apart from the products they sell being of quality, variety and at a fair price. Additionally, people watching is always a feature of this place, if one is so inclined! From the outside, the Poacher is unassuming. The interior is belied by that first impression however. 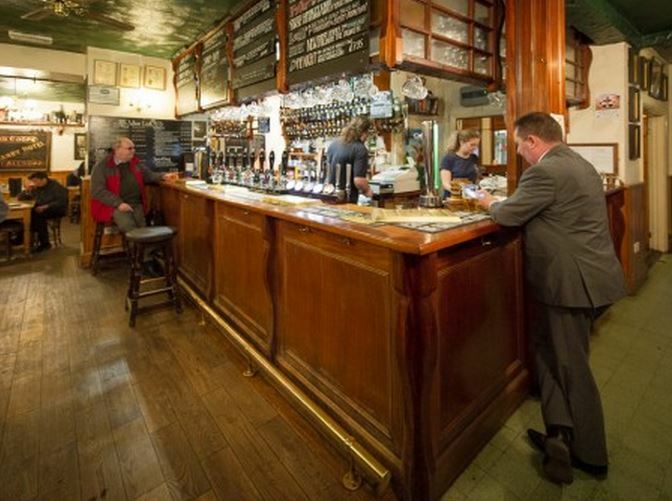 Front and side bars on two levels lined with leaning shelves and wooden tables adorn the room and yet don’t deter the bar fly and casual pub crawlers that walk along the Mansfield Road between hostelries who want to stand with a pint. Further back in the pub lies a small and delightful snug bar – a very cosy place indeed for a winter drink especially. It has its own serving hatch too which precludes the customer from having to dive out into the fray of the main bar during those busy times. This is also one hatch that is certainly not ignored by the staff as can be experienced in some pubs with lesser service. At the rear is an attractive conservatory with tiled floors and access out onto the yard beyond. Ideal for those overspill times on a Friday or Saturday evening when the pub can get very busy. The yard itself is surrounded by tall red brick walls adorned with vintage signage and for me personally, really comes into its own when live music is provided out there. Notably, on a couple of occasions, I’ve watched the excellent Kelly’s Heroes in the yard on warm early autumn evenings. What could be better, great music, a great glass of beer in your hand and listening to a superb band provided free of charge. Well done to the Poacher for all those terrific nights. I should add that Sunday and Wednesday evenings provide a further dose of free music inside the bar itself. It’s a thumbs up from me then for the friendly and attentive staff. The Lincolnshire Poacher is a credit to them all. It’s also the little matter of a thumbs up from the local CAMRA organisation too who recently awarded it their ‘Pub of the Year’ accolade. Although a little walk from Market Square and the centre of things in Nottingham (some would offer that as a great advantage) you won’t be disappointed if you seek out this pub, it’s one of the very best that Nottingham has to offer, in my humble opinion.